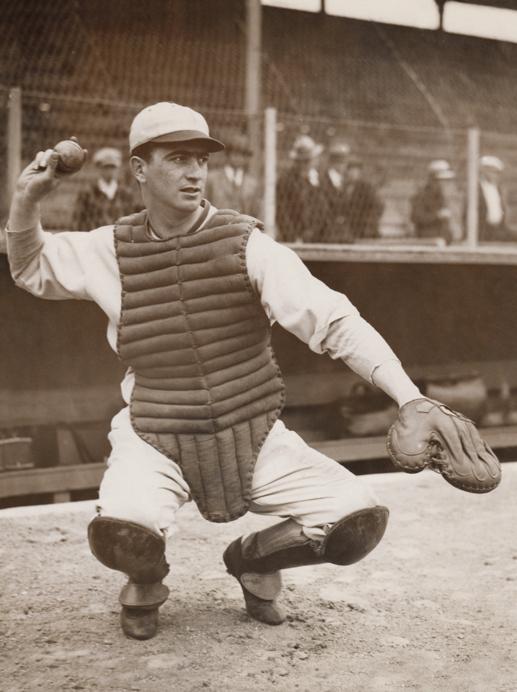 New release: Morris "Moe" Berg joined the Brooklyn Dodgers in 1923 and became a celebrated player in baseball. He was also a spy. Filmmaker Aviva Kempner has made a new documentary film about Berg called The Spy Behind Home Plate that is making the rounds at art house cinemas. My own tastes run more toward the light fantasy/fiction side of espionage, but some Spy Vibers might be interested in this historical study. 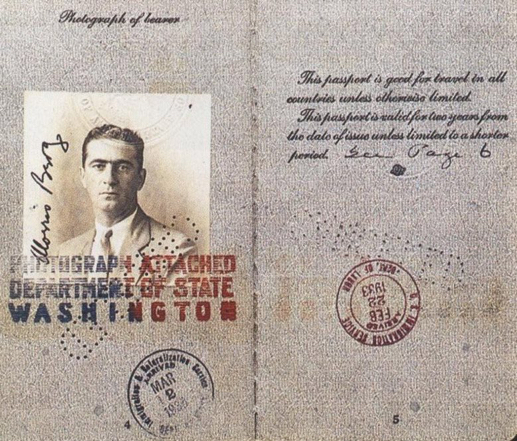 From the press release: "Aviva Kempner’s The Spy Behind Home Plate is the first feature-length documentary to tell the real story of Morris “Moe” Berg, the enigmatic and brilliant Jewish baseball player turned spy. Berg caught and fielded in the major leagues during baseball’s Golden Age in the 1920s and 1930s. But very few people know that Berg also worked for the Office of Strategic Services (OSS), spying in Europe and playing a prominent role in America’s efforts to undermine the German atomic bomb program during WWII. The Spy Behind Home Plate reveals the life of this unknown Jewish hero through rare historical footage and photographs as well as revealing interviews with an All-Star roster of celebrities and other individuals from the worlds of sports, spycraft, and history. Berg may have had only a .243 batting average during his 15-year major league career, but it was the stats he collected for the OSS that made him a most valuable player to his country during World War II." More info here. 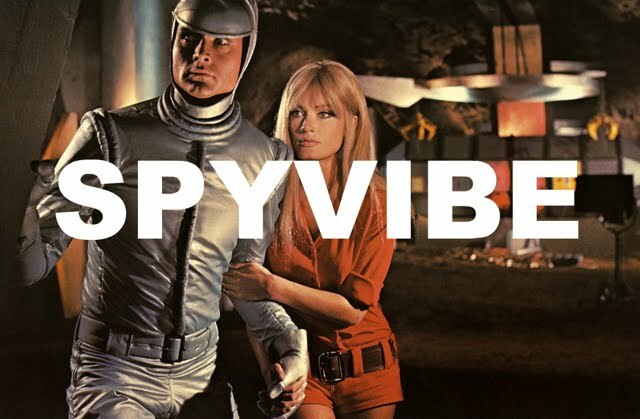 Selected Spy Vibe Posts: The Village: Part 1, Bubble Girl 63, ITC Soundtracks, Spy Vibe Radio: Public Eye, UFO Prime, Spaceship to Mars, Modesty Blaise Companion, Spy Vibe Radio: Fantomas, George Day, Fantomas Blu, Dark Shadows Doc, Bedazzled Blu-ray, Mary Quant Exhibit, Laika Calypso, Lost in Space Japan, Spy Dust Calypso, Atomic Cafe, John Barry Mono, Interview: John Barry Book, Land of the Giants Score, Skyfall Concert, Dearest Emma, Spy Vibe Radio: Upperseven, Ogilvy at Elstree, Mabuse Propaganda, Bond Beatles Day, Spy Vibe Radio: Liquidator, Diabolik LP, Fab Dresses, Eurospy Music Collection, Beetle Bailey in West Berlin, Why Mort Walker?, Spy Vibe radio: The Beatles Help!, Avengers Critical Guide, The Spotnicks, Benny Spies, James Pond 0017', Satire Stones, Annette Andre Book, Cat Day, Spy Vibe Radio: Get Smart, Caine: My Generation, Interview: Ian Ogilvy, Horror of Party Beach, Sylvie Vartan Renown, Ringo At 78, Dark Shadows Strips, Spy Vibe Radio: Flint, Archie Batman 66, Paul at 76, Beatles Pac-Man, Spy Vibe Radio: Jerry Cotton, The Invaders, 007 Horowitz Book Tour, McGoohan/Prisoner Event at Elstree, The Prisoner Interviews Vol 1, British Underground Press, Interview: Fab4 Mania, Bond Cocktail Book, Bond at Bletchley, Spy Smasher, Spy Vibe Radio: Peter Gunn, Agent Zero M, New Prisoner Comic, Dr. No Villains Edition, Spy Vibe Radio: Danger Diabolik, Dr. No 60th, Oy-Oy-Seven, Spy Vibe Radio (UFO), Cold War Comic Strips, Thunderball Event, Mission to India, Mort Walker Celebration, Peter Wyngarde Celebration, Batman 66 Exhibit, Prisoner Fifty Event, Ian Fleming Publications 2017-2018, Interview: Ed Hulse Pulp, Avengers Audio Drama, Interview: Callan At 50, Interview: Playboys, Spies, Private Eyes, TWA Returns, Spy Vibe Radio 8, Interview: Ryan Heshka, Mid-Century Modern Schulz, Agent Werewolf, Johnny Sokko 50th, Interview: Trina Robbins, Eddie Izzard, The Prisoner Capt Scarlet 50th, Hugh Hefner R.I.P., Jack Good R.I.P., Interview: Shaken Not Stirred, Callan 50th, Spy Vibe Radio 7, The Prisoner 50th Event, Spy-Fi Event, Kaho Aso 007, Two Million, Bo Diddley, Carnaby Pop, Le Carre Events, Billy Bragg Skiffle, Elvis 68, Jack Kirby The Prisoner, Casino Royale Concert, Review: The Prisoner Vol 2, Interview: The Prisoner Essential Guide, Maud Russell Mottisfont, Spy Vibe Radio 4, Batman Gallants, Adam West R.I.P., Village Triangle, Roger Moore R.I.P., Spy Vibe Radio 3, Sgt Pepper 50th, Satanik Kriminal OST, 60s Overdrive, Make Love in London, Spy Vibe Radio 2, Spy Vibe Radio 1, James Bond Strips, Propaganda Mabuse, Interview: Police Surgeon, XTC Avengers, 1966 Pep Spies, Batman Book Interview, Exclusive Fleming Interview, Avengers Comic Strips, Robert Vaughn RIP, UNCLE Fashions, Thunderbirds Are Pop!, Interview: Spy Film Guide, Lost Avengers Found, The Callan File, Mission Impossible 50th, Green Hornet 50th, Star Trek 50th, Portmeirion Photography 1, Filming the Prisoner, Gaiman McGinnins Project, Ian Fleming Grave, Revolver at 50, Karen Romanko Interview, Mod Tales 2, Umbrella Man: Patrick Macnee, New Beatles Film, The Curious Camera, Esterel Fashion 1966, Exclusive Ian Ogilvy Interview, 007 Tribute Covers, The Phantom Avon novels return, Ian Fleming Festival, Argoman Design, Sylvia Anderson R.I.P., Ken Adam R.I.P., George Martin R.I.P., The New Avengers Comics, The Phantom at 80, 007 Manga, Avengerworld Book, Diana Rigg Auto Show, The Prisoner Audio Drama Review. One of the most interesting characters I've discovered while researching pre-WWI pulps and serials is Zigomar, a criminal mastermind who debuted a couple of years before Fantomas. Created by Leon Sazie in 1909, Zigomar played an important role in early crime pulps and the evolution of genre cinema. I've been casually looking for a scan of my favorite Georges Vallée's original pulp cover for my (slowly building) Spy Vibe book and came across the very image I needed on an upcoming release by Black Coat Press. Michael Shreve, who worked on adaptations of the Madame Atomos series for Black Coat, has, from what I can tell, completed the first English translation of the early Zigomar stories. Very cool! From the press release: "Zigomar is a character dreamed up by Léon Sazie in 1909, two years before the now much more celebrated Fantômas. An evil, nefarious character, a criminal genius, Zigomar was so popular in his time that his picture could be found on bags of bread, pipes and matchboxes. Masked, hooded, or in disguise, Zigomar constantly bedevils the law. 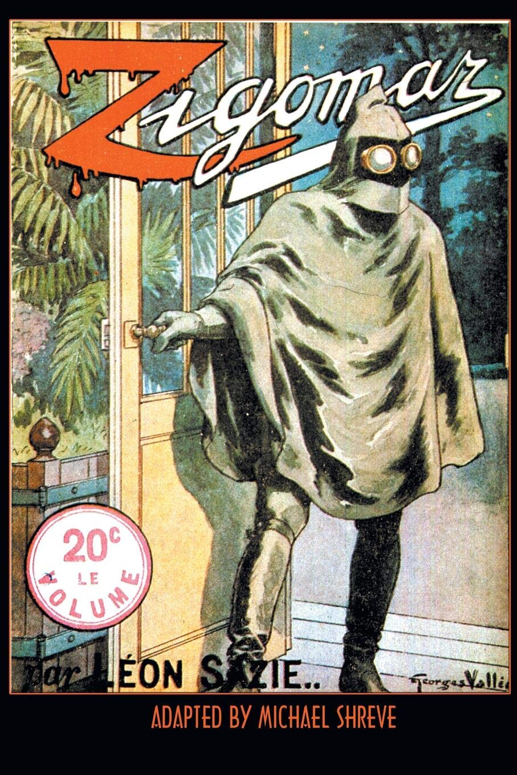 The first of the masked super-criminals, he shares with Fantômas a taste for gratuitous, melodramatic crimes, imaginative atrocities (typhus-bearing mosquitoes being only one such example), murder, kidnapping, robbery, and torture. His inevitable escape from the clutches of the law, his perpetual evasion of justice, made him very popular with the public and he left his mark on the history of crime fiction. Of Basque origin, Léon Sazie was born in Algeria in 1862 and died in an accident in Suresne near Paris in 1939. When he was still a child, his father committed suicide after being ruined in a bank fraud. Sazie eventually became a journalist, before turning to theater and, eventually, to serial fiction. He created Martin Numa, King of detectives, in 1908, and Zigomar a year later. He was also a brilliant fencer who fought several duels. This volume, translated and introduced by Michael Shreve, contains a translation of the first of the six Zigomar novels, plus an introduction, bibliography and filmography (Zigomar was adapted three times for the screen in silent movie serials)." Publishing on May 1st. More info at Black Coat Press and Amazon. Below: the wonderful cover I was searching for; a cool, stylized costume with sinister dashes of early tech and even steampunk sensibility. Spy Vibers, please check out my new book (over 700 pages!) 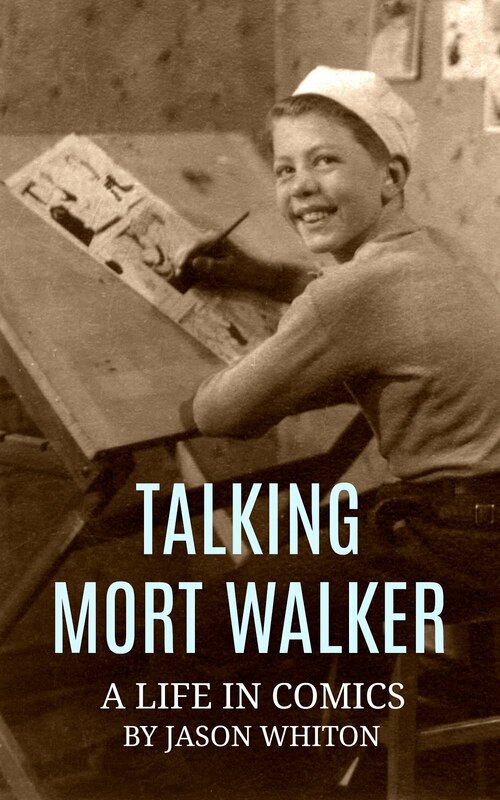 about one of America's most successful cartoonists: Talking Mort Walker: A Life in Comics. Enjoy! Selected Spy Vibe Posts: Monkey Punch: R.I.P., The Village part 1, ITC Soundtracks, Bubble Girl 63, Spy Vibe Radio: Public Eye, UFO Prime, Spaceship to Mars, Modesty Blaise Companion, Spy Vibe Radio: Fantomas, George Day, Fantomas Blu, Dark Shadows Doc, Bedazzled Blu-ray, Mary Quant Exhibit, Laika Calypso, Lost in Space Japan, Spy Dust Calypso, Atomic Cafe, John Barry Mono, Interview: John Barry Book, Land of the Giants Score, Skyfall Concert, Dearest Emma, Spy Vibe Radio: Upperseven, Ogilvy at Elstree, Mabuse Propaganda, Bond Beatles Day, Spy Vibe Radio: Liquidator, Diabolik LP, Fab Dresses, Eurospy Music Collection, Beetle Bailey in West Berlin, Why Mort Walker?, Spy Vibe radio: The Beatles Help!, Avengers Critical Guide, The Spotnicks, Benny Spies, James Pond 0017', Satire Stones, Annette Andre Book, Cat Day, Spy Vibe Radio: Get Smart, Caine: My Generation, Interview: Ian Ogilvy, Horror of Party Beach, Sylvie Vartan Renown, Ringo At 78, Dark Shadows Strips, Spy Vibe Radio: Flint, Archie Batman 66, Paul at 76, Beatles Pac-Man, Spy Vibe Radio: Jerry Cotton, The Invaders, 007 Horowitz Book Tour, McGoohan/Prisoner Event at Elstree, The Prisoner Interviews Vol 1, British Underground Press, Interview: Fab4 Mania, Bond Cocktail Book, Bond at Bletchley, Spy Smasher, Spy Vibe Radio: Peter Gunn, Agent Zero M, New Prisoner Comic, Dr. No Villains Edition, Spy Vibe Radio: Danger Diabolik, Dr. No 60th, Oy-Oy-Seven, Spy Vibe Radio (UFO), Cold War Comic Strips, Thunderball Event, Mission to India, Mort Walker Celebration, Peter Wyngarde Celebration, Batman 66 Exhibit, Prisoner Fifty Event, Ian Fleming Publications 2017-2018, Interview: Ed Hulse Pulp, Avengers Audio Drama, Interview: Callan At 50, Interview: Playboys, Spies, Private Eyes, TWA Returns, Spy Vibe Radio 8, Interview: Ryan Heshka, Mid-Century Modern Schulz, Agent Werewolf, Johnny Sokko 50th, Interview: Trina Robbins, Eddie Izzard, The Prisoner Capt Scarlet 50th, Hugh Hefner R.I.P., Jack Good R.I.P., Interview: Shaken Not Stirred, Callan 50th, Spy Vibe Radio 7, The Prisoner 50th Event, Spy-Fi Event, Kaho Aso 007, Two Million, Bo Diddley, Carnaby Pop, Le Carre Events, Billy Bragg Skiffle, Elvis 68, Jack Kirby The Prisoner, Casino Royale Concert, Review: The Prisoner Vol 2, Interview: The Prisoner Essential Guide, Maud Russell Mottisfont, Spy Vibe Radio 4, Batman Gallants, Adam West R.I.P., Village Triangle, Roger Moore R.I.P., Spy Vibe Radio 3, Sgt Pepper 50th, Satanik Kriminal OST, 60s Overdrive, Make Love in London, Spy Vibe Radio 2, Spy Vibe Radio 1, James Bond Strips, Propaganda Mabuse, Interview: Police Surgeon, XTC Avengers, 1966 Pep Spies, Batman Book Interview, Exclusive Fleming Interview, Avengers Comic Strips, Robert Vaughn RIP, UNCLE Fashions, Thunderbirds Are Pop!, Interview: Spy Film Guide, Lost Avengers Found, The Callan File, Mission Impossible 50th, Green Hornet 50th, Star Trek 50th, Portmeirion Photography 1, Filming the Prisoner, Gaiman McGinnins Project, Ian Fleming Grave, Revolver at 50, Karen Romanko Interview, Mod Tales 2, Umbrella Man: Patrick Macnee, New Beatles Film, The Curious Camera, Esterel Fashion 1966, Exclusive Ian Ogilvy Interview, 007 Tribute Covers, The Phantom Avon novels return, Ian Fleming Festival, Argoman Design, Sylvia Anderson R.I.P., Ken Adam R.I.P., George Martin R.I.P., The New Avengers Comics, The Phantom at 80, 007 Manga, Avengerworld Book, Diana Rigg Auto Show, The Prisoner Audio Drama Review. Japanese manga artist Monkey Punch (Kazuhiko Katō) passed away on April 11th. Spy Vibers might be familiar with his famous creation, Lupin III, a popular character who debuted his special brand of international intrigue, action, and humor in the pages of Weekly Manga Action in 1967. From Deadline: "The title character is a master thief named Arsène Lupin III who brings a notorious heritage to his vocation- he is presented as the grandson of Arsène Lupin, the “gentleman thief” who had been introduced five decades earlier by French author Maurice Leblanc. Young Katō immersed himself in Leblanc’s vintage tales and hatched the idea of a third-generation heir to the Lupin legacy as a manga protagonist. Wrapping his anti-hero in a flashy red jacket, the young manga illustrator incorporated elements of James Bond into his new creation and based supporting characters on actors (like James Coburn) or Western pop culture influences (among them Mad Magazine, Hitchcock films, Popeye and pin-up girl art). Lupin III (often accompanied by his small but elite crew of specialists) is pursued by Inspector Koichi Zenigata of Interpol, the dutiful detective who doggedly pursues his slippery quarry." 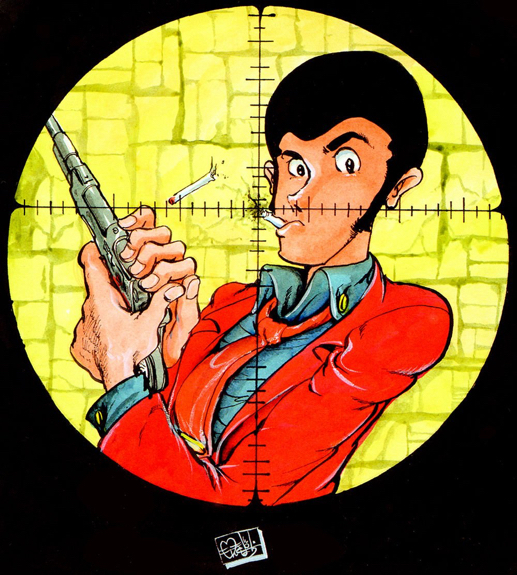 My first introduction to Lupin III was viewing re-runs of the classic anime series after school when I lived in Japan. Even when the plot veered away from my vocabulary, I was completely enthralled with the interaction between the characters, the sense of romance, cool action sequences, and never-ending laughs. Monkey Punch's creation has lived on through many incarnations in print, on screen (including work by Miyazaki Hayao), and has even inspired countless Jazz and re-mix albums -look for the Punch the Monkey series from Readymade Records (Pizzicato Five). Monkey Punch was eighty-one. More info at the New York Times. 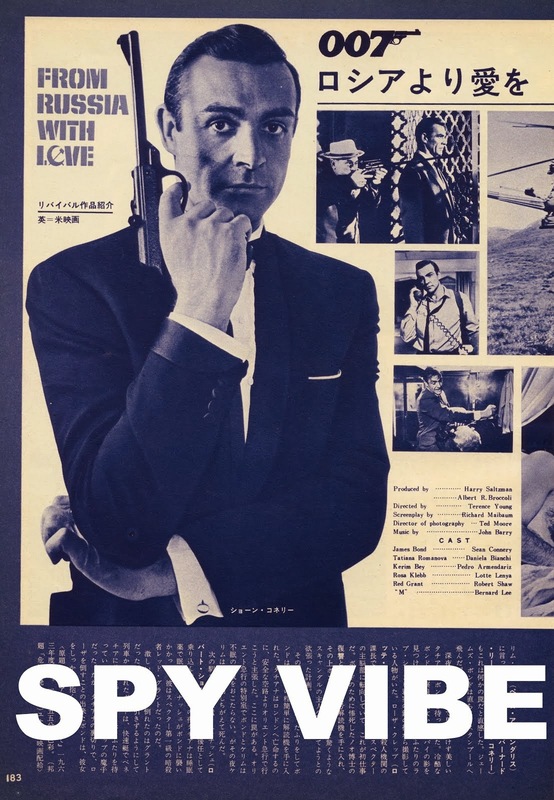 Selected Spy Vibe Posts: The Village part 1, ITC Soundtracks, Bubble Girl 63, Spy Vibe Radio: Public Eye, UFO Prime, Spaceship to Mars, Modesty Blaise Companion, Spy Vibe Radio: Fantomas, George Day, Fantomas Blu, Dark Shadows Doc, Bedazzled Blu-ray, Mary Quant Exhibit, Laika Calypso, Lost in Space Japan, Spy Dust Calypso, Atomic Cafe, John Barry Mono, Interview: John Barry Book, Land of the Giants Score, Skyfall Concert, Dearest Emma, Spy Vibe Radio: Upperseven, Ogilvy at Elstree, Mabuse Propaganda, Bond Beatles Day, Spy Vibe Radio: Liquidator, Diabolik LP, Fab Dresses, Eurospy Music Collection, Beetle Bailey in West Berlin, Why Mort Walker?, Spy Vibe radio: The Beatles Help!, Avengers Critical Guide, The Spotnicks, Benny Spies, James Pond 0017', Satire Stones, Annette Andre Book, Cat Day, Spy Vibe Radio: Get Smart, Caine: My Generation, Interview: Ian Ogilvy, Horror of Party Beach, Sylvie Vartan Renown, Ringo At 78, Dark Shadows Strips, Spy Vibe Radio: Flint, Archie Batman 66, Paul at 76, Beatles Pac-Man, Spy Vibe Radio: Jerry Cotton, The Invaders, 007 Horowitz Book Tour, McGoohan/Prisoner Event at Elstree, The Prisoner Interviews Vol 1, British Underground Press, Interview: Fab4 Mania, Bond Cocktail Book, Bond at Bletchley, Spy Smasher, Spy Vibe Radio: Peter Gunn, Agent Zero M, New Prisoner Comic, Dr. No Villains Edition, Spy Vibe Radio: Danger Diabolik, Dr. No 60th, Oy-Oy-Seven, Spy Vibe Radio (UFO), Cold War Comic Strips, Thunderball Event, Mission to India, Mort Walker Celebration, Peter Wyngarde Celebration, Batman 66 Exhibit, Prisoner Fifty Event, Ian Fleming Publications 2017-2018, Interview: Ed Hulse Pulp, Avengers Audio Drama, Interview: Callan At 50, Interview: Playboys, Spies, Private Eyes, TWA Returns, Spy Vibe Radio 8, Interview: Ryan Heshka, Mid-Century Modern Schulz, Agent Werewolf, Johnny Sokko 50th, Interview: Trina Robbins, Eddie Izzard, The Prisoner Capt Scarlet 50th, Hugh Hefner R.I.P., Jack Good R.I.P., Interview: Shaken Not Stirred, Callan 50th, Spy Vibe Radio 7, The Prisoner 50th Event, Spy-Fi Event, Kaho Aso 007, Two Million, Bo Diddley, Carnaby Pop, Le Carre Events, Billy Bragg Skiffle, Elvis 68, Jack Kirby The Prisoner, Casino Royale Concert, Review: The Prisoner Vol 2, Interview: The Prisoner Essential Guide, Maud Russell Mottisfont, Spy Vibe Radio 4, Batman Gallants, Adam West R.I.P., Village Triangle, Roger Moore R.I.P., Spy Vibe Radio 3, Sgt Pepper 50th, Satanik Kriminal OST, 60s Overdrive, Make Love in London, Spy Vibe Radio 2, Spy Vibe Radio 1, James Bond Strips, Propaganda Mabuse, Interview: Police Surgeon, XTC Avengers, 1966 Pep Spies, Batman Book Interview, Exclusive Fleming Interview, Avengers Comic Strips, Robert Vaughn RIP, UNCLE Fashions, Thunderbirds Are Pop!, Interview: Spy Film Guide, Lost Avengers Found, The Callan File, Mission Impossible 50th, Green Hornet 50th, Star Trek 50th, Portmeirion Photography 1, Filming the Prisoner, Gaiman McGinnins Project, Ian Fleming Grave, Revolver at 50, Karen Romanko Interview, Mod Tales 2, Umbrella Man: Patrick Macnee, New Beatles Film, The Curious Camera, Esterel Fashion 1966, Exclusive Ian Ogilvy Interview, 007 Tribute Covers, The Phantom Avon novels return, Ian Fleming Festival, Argoman Design, Sylvia Anderson R.I.P., Ken Adam R.I.P., George Martin R.I.P., The New Avengers Comics, The Phantom at 80, 007 Manga, Avengerworld Book, Diana Rigg Auto Show, The Prisoner Audio Drama Review.